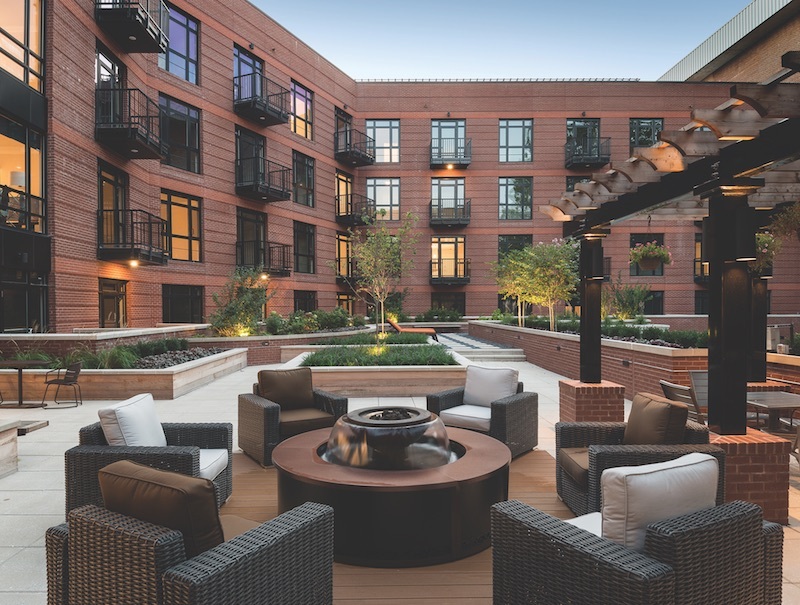 Hospital turned apartment brings luxury living to a D.C. neighborhood – and saves a valued piece of architecture. But the road from start to finish was a rocky one. It involved a complete roof-to-basement renovation of the building, delicate structural underpinning work to support two levels of below-grade parking, sensitive preservation work that needed Historic Preservation Review Board approval, and the design and construction of a world-class multifamily facility fitting of the neighborhood. Called 700 Constitution, the complex houses 139 units (studio, one-, and two-bedroom), with an outdoor courtyard, fitness center, community room, yoga studio, e-lounge, and a package delivery system. A rooftop garden with bio retention, deck, and grilling area offers views of the U.S. Capitol dome and the Supreme Court. The existing floors, with their double-loaded corridor and standard patient room depths, did not provide the apartment plan required in today’s rental market. The solution involved relocating the building’s corridor outside of the column-defined circulation pattern by adding a steel-frame and concrete structure on the rear of the building. This shift also allowed the team to add balconies to the rear façade of the building, which was not highly scrutinized by the preservation boards. Each day of the 18-month demolition process presented a new obstacle to the design concept, most unforeseen. The demolition process exposed four different structural systems in varying states of soundness. Former exterior masonry walls with Palladian-style windows were uncovered intact, sandwiched between walls of later construction. This is just a taste of what the team faced and overcame to complete this award-winning project.